If you are new to cooking tofu, you might not know the preparation required to create the best tofu dishes. If you were to take tofu out of its package and put it directly into a hot pan, it would likely crumble as you tried to flip the giant, wet block, causing hot oil to sizzle and spew all over your stove and end up tasting like a warm, tasteless, soggy sponge. Don’t be discouraged, the tips and tricks we are about to share will help fool-proof the cooking process. You’ll end up with golden-brown slices (or cubes) that are full of flavor and have enjoyable texture, far from the characteristics a sponge. When it comes to preparing tofu, time is the biggest requirement. Luckily, it doesn’t take a whole lot of physical labor but rather waiting for the tofu to be ready. First, we will provide you with a walk-through of how to press the excess liquid from your tofu. By squeezing out as much water as possible, you allow the tofu to absorb marinade or the flavors from other ingredients. In addition, you remove a lot of the moisture that causes oil to splatter everywhere—keeping your stove much cleaner and preventing painful burns on your hands while you attempt to stir ingredients. You will end up with crispier pieces of tofu with a golden hue, more texturally and visually appealing than if you were to skip the pressing process altogether. The following steps are for draining a whole block of tofu, not the pre-cubed type. If your tofu is already cubed, read through the notes at the end of the article for preparation tips. Nest a colander in your sink or inside a large bowl. Slit the film over the package of tofu while holding it over the strainer, and pour the liquid through. Cover the bottom of the colander with a folded clean towel or several layers of paper towel. Finish opening the package and remove tofu, gently setting it on top of the towels. Next, you will need to gather items from your kitchen to create a weighted press. A small cutting board or flat-bottom dish works well for the press. Then, you’ll need weights: canned food is perfect. On top of the tofu, evenly rest the cutting board or dish. Then, carefully and evenly stack the canned food on top or other forms of weight. If your weights are not evenly distributed over the tofu, you’ll end up with a lopsided block. Let the tofu sit for at least half an hour and up to 1-2 hours for drier tofu. Before disassembling your makeshift press, apply a little pressure by hand to squeeze out any remaining drops of liquid. If you press too hard, you might break the tofu apart so be careful. Slice or cube the tofu for use. 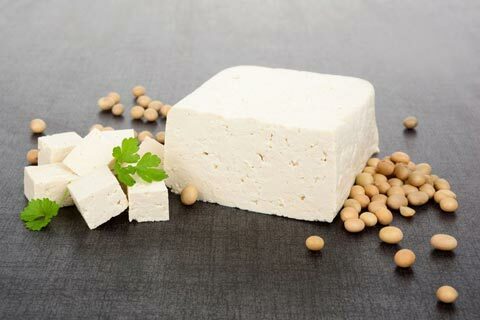 If you’ve purchased pre-cubed tofu, you can still remove some of the liquid in a similar way. You’ll just have to be a little more careful since the tofu is more likely to break apart and crumble. Rather than pressing the tofu inside a colander, simply line a plate with towels and spread the cubes in an even layer. You’ll probably have to use a bigger board or dish to cover the cubes then stack weights evenly in the same manner. It may seem counterintuitive but marinade tofu after the water has been pressed out is a great way to infuse it with flavor. Remember, tofu behaves similar to a sponge so the marinade will be absorbed pretty fast and with ease—meaning if the marinade is extremely spicy, you’ll definitely taste it. You can press tofu that is of the Soft, Firm and Extra Firm varieties. Silken tofu is more gel-like and is best used in desserts or smoothies. It won’t stand up to the pressing process, and you’ll quickly understand why after opening a package of this stuff. If you don’t want to use all of your tofu in one dish, simply cut off the portion needed before pressing. Store the leftovers in an airtight container with about an inch of pure, cold water in the bottom. If you change the water every day, flipping the block each time, it should keep well for up to 2-3 days. Some cooks even freeze their tofu in order to encourage a chewier consistency. If you choose to do so, put the entire package in the freezer for at least a full 24 hours. Remove and let thaw in the fridge until fully defrosted which will take several hours or up to a day or two, depending on the temperature of your refrigerator. Press tofu according to instructions above. What is the Easiest Way to Press Tofu? If you cook with tofu frequently, it might be worth your time to invest in a more efficient process for pressing out excess water. You can actually purchase a tofu press that will do all of the work for you (and also keep your counters clear of makeshift towers). They are extremely affordable and easy to use. We suggest the EZ Tofu Press which can be ordered online. You won’t have to set up your own contraption, and it does all of the work in 10-15 minutes due to its ability to firmly and evenly squeeze the block of tofu.